Google Unlocked is a browser extension for Google Chrome and Mozilla Firefox that displays hidden results on Google Search automatically. Google hides results from Google Search when it receives DMCA complaints. The company does not just remove results with DMCA complaints from Google Search but adds information to search results pages to inform users of Google Search about it. Users may follow these links to look up information and the links that Google removed from its search results pages. Google Unlocked automates the process. The browser extension displays removed links at the end of the search results page so that you may access these directly. The extension lists links that Google removed because it received complaints. The links lack titles which makes it difficult sometimes to find out more about the page without visiting it. A click on a link opens the result directly in the browser of choice. Note that some of these links may no longer work. Google Unlocked is an open source extension that is available on the Chrome Web Store and Mozilla AMO. It should work in other Chromium-based and Firefox-based browsers such as Opera or Vivaldi (not tested). 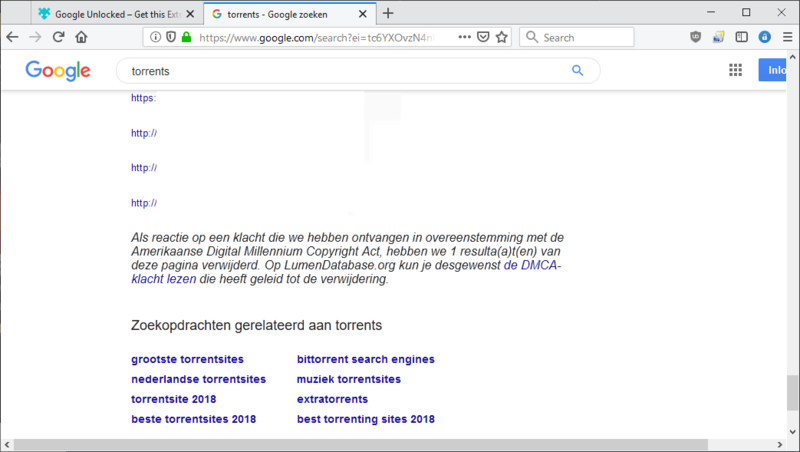 The extension parses the pages the DMCA notices get published on and adds any link that it finds on the page to the search results. You can check out the source code to find out more about the process. Google Unlocked restores unfiltered Google results, at least when it comes to DCMA-based changes to the results. Many of the filtered results point to sites where users may download files or stream media, but some may also point to pages removed in error from the results. Some may find the lack of page titles or options to open a cached copy of a page problematic; this is not the fault of the extension, however, as it can only return what is provided on the DCMA notices web pages. It is worth a try if you find yourself clicking through to the notices page regularly or just want unfiltered results when it comes to DCMA notices and removed results. Now You: How do you handle search result pages with removed links? Personally, I don’t use torrents. Not sure who to blame for this mess, but I don’t remember Google ever being as terrible as it has become today. Yuliya, you are not sure who to blame? Politicians vote these laws, blame them and when the time comes don’t vote them again. Did they actually outlaw an entire communications protocol? The link you provided doesn’t say that, but I may have misunderstood. It sounded more like they were talking about piracy. If they outlawed a communications protocol, then that’s not just silly, but unsupportably so. It would be no different than outlawing HTML or email. No, the protocol hasn’t been blocked just the d/l of copyrighted content. I use a plethora of different search engines. all known goolag networks and connections, they’re tellin all y’all tall tales. Who sends the DMCA censorship requests to Google, Goolag chicom or Guantanamo uscap ? Google doesn’t only filter DMCA results, it filters anything the US government or major corporations request it to. Not surprisingly this censorship operates hand in hand with the rest of the Five Eyes members. Maybe different. Anyway, some great careers, and if one has military or some other specialty, then the application process is more streamlined. The add-on itself leads to an interesting Torrent Search site which is, most likely, being watched by some entity to catch the unwary in wrongdoing. Maybe someone wants to download the Bible. I hope Startpage & duck duck pick this up as an option. I like to experience the Internet in all its agonizing glory. Martin, (Or anybody else who know this) I personly use startpage.com so I am wondering knowing that startpage.com is using the engine from google.com, does this extension also work when you use startpage.com? Now and I want this off after I see whats.